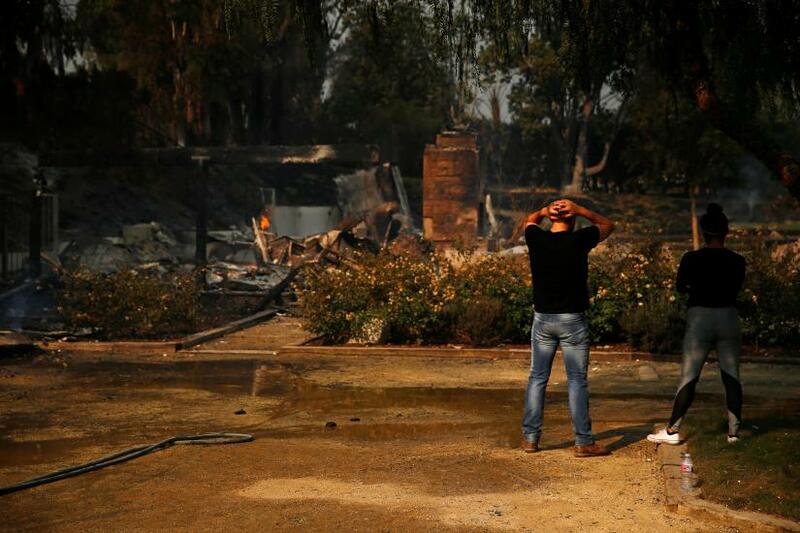 The charred remains of fourteen more victims have been found in and around a Northern California town overrun by flames from a massive wildfire, officials said on Saturday, raising the death toll to 23. 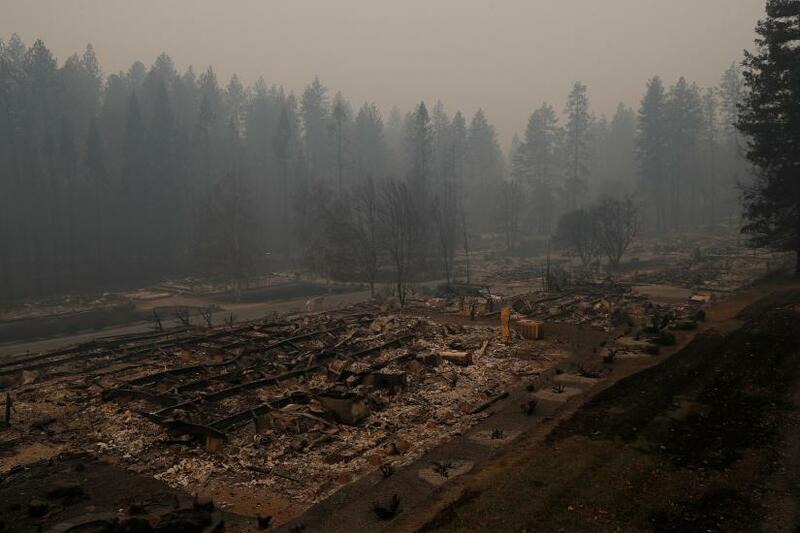 The bodies were recovered in and around Paradise, California, a mountain community some 90 miles (145 km) north of Sacramento left devastated by the Camp Fire, California Department of Forestry and Fire Protection spokesman Scott Maclean said. Maclean said no details were immediately available about the circumstances of the deaths and that the bodies' badly burned condition would make identification difficult. The Camp Fire burned down more than 6,700 homes and businesses in Paradise, more structures than any other California wildfire on record. Several of the victims discovered earlier this week were found in or near burned out cars, police have said. The flames descended on the mountain community so fast that many people were forced to abandon their vehicles and run for their lives down the sole road through the mountain town. An additional 35 people had been reported missing and three firefighters had been injured. As of Saturday afternoon the Camp Fire had blackened more than 100,000 acres (40,500 hectares) of forest land. Crews had cut containment lines around about 20 percent of the blaze. About 500 miles (800 km) to the south, the Woolsey Fire burning in the foothills above Malibu doubled in size overnight, threatening thousands of homes after triggering mandatory evacuation orders for a quarter million people in the oceanside city as well as other communities in Los Angeles and Ventura counties. 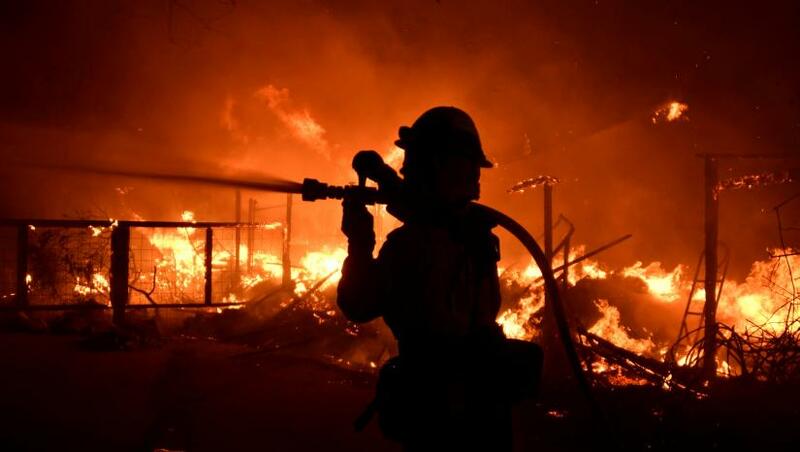 The fire has destroyed "a lot of homes," with a full count still under way, and has now charred more than 70,000 acres, Los Angeles County Fire Chief Daryl Osby said. "Our firefighters have been facing some extreme, tough fire conditions that they said that they've never seen in their lives," Osby said at a news conference. He said crews hoped to take advantage of a lull on Saturday in the fierce Santa Ana winds driving the flames, but that gusts could return on Sunday. All 13,000 residents of Malibu, which is 30 miles west of downtown Los Angeles, were told to get out on Friday. The bodies of two people were discovered in Malibu but it was too early to determine if they died from fire or another cause, Los Angeles County Sheriff's Department officials said. Firefighters have been unable to build any containment lines around the Woolsey Fire, but officials said they hoped to take advantage of a lull in winds on Saturday to make progress. The Woolsey Fire broke out on Thursday in Ventura County near Los Angeles and quickly jumped the 101 Freeway, a major north-south artery, in several places. On Friday, it crossed the Santa Monica Mountains toward Malibu, where flames driven by wind gusts of up to 50 miles per hour (80 kph) raced down hillsides and through canyons toward multi-million dollar homes. Early on Saturday, flames approached Malibu's Pepperdine University, a private residential college with 7,700 students, where many remained sheltered on the main campus. Among those forced to flee the Malibu area were celebrities including Lady Gaga and Kim Kardashian, who said on Twitter that flames had damaged the home she shares in nearby Calabasas with Kanye West. In Ventura County, most of the town of Thousand Oaks was ordered evacuated, adding to the anguish days after a gunman killed 12 people in a shooting rampage at a bar. President Donald Trump, weighing in on the emergency during a trip to France, said early on Saturday that "gross mismanagement of forests" was to blame. "There is no reason for these massive, deadly and costly forest fires in California except that forest management is so poor," he wrote in a Twitter post. Trump, a Republican, has previously blamed California officials for fires and threatened to withhold funding, saying the state should do more to remove rotten trees and other debris that fuel blazes. State officials have blamed climate change and say many of the burn areas have been in federally-managed lands. "Our focus is on the Californians impacted by these fires and the first responders and firefighters working around the clock to save lives and property - not on the President's inane and uninformed tweets," Evan Westrub, a spokesman for California Governor Jerry Brown said in an email.